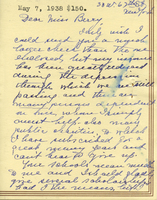 Dorothy Eustis says that it was kind of Martha Berry to write and that she is enclosing a check for $150. 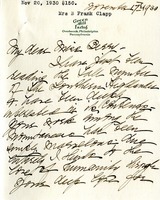 A letter to Martha Berry attached to a check for $150 which will be used to pay for a student to go to Berry for a year. 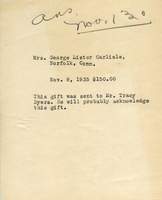 A gift of $150 that was received on November 13th. Gertrude sends $150 but wishes it could be more, but her income has been reduced. 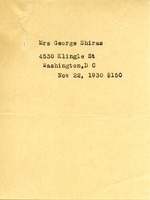 Mrs. George Shiras sends $150. A check for $150 in response to a letter asking for donations for the Berry Schools. Mrs. Clara B. Clapp has just read the fall issue of the Southern Highlander and sends a check for $150. Mrs. William Lloyd encloses a check for $150 towards the current expenses of The Berry Schools. 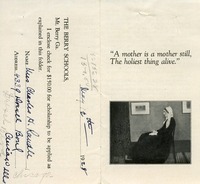 On the back are intimate stories of students who would benefit from these funds. 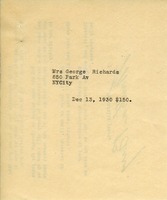 Archibald R. Livingston encloses a check for $150 towards the current expenses of The Berry Schools. On the back are two intimate stories about students at Berry who are in need of these donations. 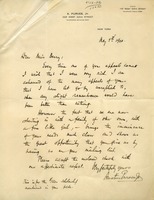 Archibald R. Livingston encloses a check for $150.00 as scholarship money to be applied to The Berry Schools. A scholarship check for $150 to the Berry Schools in response to a brochure of stories of students in need. Austin Purves Jr. apologizes for having never donated before and sends a check for $150. 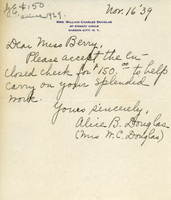 A check for $150 to be used as a student scholarship for a Berry student for one year in response to Martha Berry's request letter for donations.